What Are the Benefits of Installing a Disabled Access Lift? Lifts are one of the most- if not the most- useful accessibility equipment available. They are essential for individuals who have mobility issues and are unable to move safely and securely between floors of a building. Even if you are a fully mobile individual, you probably understand how tiring and difficult it can be to ascend or descend multiple floors of a building at a time, so it is incredibly important that the less mobile individuals in our society have some form of help with regards to full access of a building. Being specialists in space saving lifts, we understand just how much of a lifeline installing a lift in a business or home can be. So what exactly are the benefits of installing a disabled access lift for your home? The efficiency of any lift lies in the way that it designed. Disabled access lifts are designed in such a way that they can carry large amounts of weight without having to sacrifice any speed or safety of the user. They are especially popular with wheelchair bound individuals, as they provide an incredibly safe and allow the user to travel in his or her own wheelchair, without the need to exit the chair like you would with a stair lift. This is why disabled access lifts are extremely popular within the commercial industries, as they can give people with disabilities more freedom and independence to shop and move around during their daily lives. As we mentioned above, many people choose to install a disabled access lift because they are one of the safest accessibility options available. There is no need to remove yourself from a wheelchair, and therefore reducing the possibility of injury when using the lift which is something that many families and friends worry about when a disabled loved one lives alone. The way the lift works is simple- just wheel yourself onto the platform and select the floor that you need access. No difficult controls and a safe, secure way to travel between floors! Even though disabled access lifts are much bigger than their stair lift counterparts, it doesn’t mean that they are slower and more sluggish. In fact, using a lift can often result in a faster transition between floors as more often than not, the motors used are much more powerful, meaning they can operate quicker, even with the added weight of a wheelchair on top of the weight of a person. 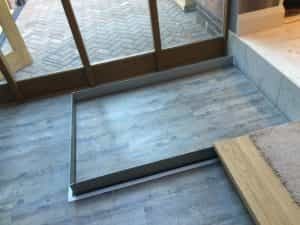 Disabled access lifts allow disabled people the ability to get around multi-floored with much more freedom than they would have without any form of accessibility aid in place. It can make people who normally may feel like they have to rely on others feel more independent, too! Are you looking to install a reliable, safe disabled access lift in your home or business? Don’t hesitate to get in touch with us here at Axess 2. Call us today on 01200 315 025 and have a chat to one of our advisors. Keep in touch with us over on Facebook, Twitter, Google+ and YouTube pages, too!